Whether you are new at managing a restaurant, or you are just starting out as a new waiter/waitress and need guidance, if you are going to work in the food service industry, you need to know the types of service restaurants offer. We're going to break this all down in this article. Restaurants are categorized into three basic types. Fine Dining – The accoutrements of a fine dining establishment are table linens, china, luxurious surroundings, and subdued lighting to encourage lingering. There is a host or maître d, who is in charge of all servers, bussers, and the sommeliers, or wine stewards. There is an extensive menu and an equally extensive wine list. Fine dining is a very slow-paced dining experience, where your guests will be around for several hours. The fine dining experience promises the customer a full service restaurant with highly trained staff in uniform or more formal attire than jeans and a t-shirt. The kitchen staff is usually formally trained and has a traditional hierarchy in terms of staffing. The menu is typically extensive and features high quality and often unusual ingredients that require elaborate preparation. Orders are prepared individually, with great attention to detail. Presentation is typically very artistic. Fine dining also offers a full bar with separate bar staff. The sommelier is also responsible for the wine that the restaurant offers. Bistro/Trattoria – This is a nice restaurant, often family owned, and covers quite a range of establishments that range all the way from table-cloth covered, to a more simple style. A bistro is more typically French, offering contemporary cuisine, with good-sized portions. Wine is often available, but from a very limited list. Most bistro cuisine offers fresh local produce. Trattorias are traditionally Italian and are less formal than the fine dining experience. The service is casual, the prices are reasonable, and the emphasis is on return customers, rather than on fancy food. Family – These restaurants are often referred to as family-style, diners, or theme restaurants and do not have table linens or china. The food is simple and the staff is less experienced than in a fine dining or bistro establishment. Family restaurants, as a theme restaurant, are usually crab houses, BBQ restaurants, and so forth. Other family restaurants are chain restaurants like Denny's or IHOP. Diners are more specifically casual, with an emphasis on traditional food, like hamburgers and sandwiches. All restaurants have specific positions for their staff. The family restaurants will have fewer positions and a more casual approach to service. Most restaurants will have a general manager, a dining room manager, hosts, servers, bussers, and expediters. A fine dining establishment will also have a sommelier and a captain. General Manager – Oversees the entire operation of the restaurant, from the dining room, to public relations and marketing. Dining Room Manager – This position takes care of the dining room, its customers and servers. This individual must ensure that costs are kept to a minimum, and is often in charge of hiring and firing of staff. It is the dining room manager's duty to train, or ensure training, for all front room staff, including servers, bussers, and expediters. Captain – This position is found usually only in a fine dining establishment and the duties include service in a specific section of tables. This individual may take orders and assist servers in that section. This individual rarely leaves the floor because all responsibility for the section is his or hers. Host/ess – The host greets the customer, seats them appropriately, and provides a menu. This individual will also take reservations over the phone. The host/ess is responsible for filling service stations, informing servers of changes in the menu and/or specials, and helps to seat large parties. Sommelier – The wine steward helps to create the wine list, takes care of the wine inventory, recommends wine to customers, according to their tastes and the meal they have chosen, and serving the bottle of wine. Head Waiter – Also known as the maître d, ensures a pleasant dining experience by the patrons. This individual is responsible for teaching the serving staff the nightly menu specials, preparation methods, supervises the serving staff and appearance, and handles clean-up and closing. Server – Waiter or waitress. This individual is responsible for taking orders from the customer and serving the customer with high quality service that start with a friendly greeting and query for immediate needs. The server provides the patrons with menu information, preparation methods, specials, wine pairings, takes orders – both food and drink, interacts with the kitchen staff, serves the food and beverages, performs side duties as needed. Busser – These individuals assist the servers by keeping the service area clean and tidy. The busser can be the server's best friend. While the server is busy, the bus person will keep normal beverage glasses filled, handle requests for additional utensils and napkins, and handle any accidents that might occur. The busser also takes care of the clean up of the table between courses, and when the table departs. The busser is often responsible for cleaning the restrooms. This section is included because every person who works in an eating establishment is responsible for customer service, and in a restaurant that means acting like a host. The duties of a host are to ensure that your customers are welcomed, and made as comfortable as possible for the entire time that they are guests in your establishment. Every individual working in the restaurant has an impact on the patrons, and it is vital that every employee understands how important it is to act as a host or hostess. The restaurant business is a hospitality business. Customer service means everything here. Learning the hierarchy of your establishment will go a long way toward advancement. Each position has a specific list of duties, and you must master every job and list of duties in order to advance, if that is your intention. For some of the more complicated serving situations, such as in fine dining, it is almost essential to start as a busser so that you can learn the way things are done in your restaurant. Contrary to the average American's understanding, table service is much more than food being brought to your table for a "sit down" meal. In this time of fast food establishments, we have removed ourselves from the attributes of sitting down to a meal and enjoying the service. Table service is the type of service a restaurant adopts, trains its employees to facilitate, and requires that everyone use the procedures established. This ensures that a uniform standard of service will be used. Once you learn about each type of table service, you will begin to see how it has been adopted, then adapted to each restaurant where you have either worked or patronized. American Service – American table service combines the service methods of several traditional forms that originated in two or more countries. Because of this definition, it should probably be listed last. There can be three different forms of service offered at any given meal. French table service is when your salad course is brought out to the table in a large bowl, and then your server places each guest's portion on an individual plate. When your soup course is brought out in a large tureen and placed in front of the host or hostess of the party who then serves out individual portions, this is considered English table service.The main course brought out on individual dinner plates and placed before each guest is called Russian table service. These forms of table service are derived from the countries in which they originated and have been adapted to American standards. English Service – As indicated above, this is often called host service. All the dishes are stacked in front of the host or hostess, who then proceeds to serve the individual plates from the platters and bowls placed in front of him or her. Most Americans have seen this form of service at home on Thanksgiving, where the husband will carve the turkey, and the wife will prepare the plates to be passed around the table to their guests. As with most forms of table service, women are served first and then men are served in order, beginning to the right of the server. Where you are most likely to see English service is in a tea room, where a tray containing the tea and sandwiches is placed in front of the hostess and she pours the cups of tea and passes a plate with sandwiches around to her guests. Certain holiday meals with a special dessert are also served English style, where the Yule Log or ignited Christmas pudding is brought to the table and placed before the host or hostess, who then prepares each individual plate. This sort of service is usually by request only. The only time it is almost always used is when there is a birthday, and a cake is brought before the host, complete with candles and plates. Once the festivities have been completed, the host then slices and distributes the plates to his guests. French Service – This is the most formal table service available, which is used in clubs, hotels, and restaurants. In French service, there is a side table that is wheeled to the table where your guests are seated. All the food is on the side table, arranged beautifully on platters, tureens, or chafing dishes, and generally presented to the guests for inspection prior to the dish being prepared, then placed on the table. Each guest is then served from the side table. Platter service is a modification of French service, where food is arranged on serving dishes with a serving utensil and then offered to each guest, who then serves himself from the platter. Most French service is for the salad course, where the server brings a salad cart to the table, prepares the salad table-side, then serves from the serving bowl. One last French service adaptation is the custom of bringing several plates of salads or desserts to the table on a cart and allowing the customer to choose which looks the most appetizing and appealing to them. Russian Service – This is the most common form of service used in restaurants today, where the plates are brought to the table already plated, garnished and ready to serve. Each guest is presented with the plate that he or she ordered. There is no table-side service in Russian service. Buffet Service – Most people are familiar with buffet service, especially if you have ever visited a restaurant that offers the salad bar or dessert bar. The patrons must leave the table, go to the buffet offering, select a plate, and serve themselves from the variety of foods offered. Family Style Service – This is a modification of American service. All food preparation is done in the kitchen. The food is then served on large platters, or in bowls, and then passed around the table, with each guest serving themselves from the platter or bowl. This form of service is a derivative of the service that most Americans use in their own homes, and there is very minimal server activity in this form of service. This is associated with fine dining and allows the guest to watch the preparation of the food they will eat. This helps your guest see that food is prepared specifically for them, that it is fresh, and uses the finest ingredients. As a server, you must never touch the food with your hands. Always use whatever utensils that are required. Some of the more easily recognized tableside service offerings include the preparation of a Caesar salad, or flambé desserts such as Crepes Suzette or Banana Foster. If the server is actually going to cook anything tableside, you must be especially careful that you know how to use the tools and equipment. Most servers are very well trained at tableside service, and are usually not asked to perform a task for which they are absolutely not trained. Each restaurant has a required table setting that must be strictly followed by each server. Some restaurants have one table setting for their lunch menu, and a completely different one for their dinner menu. If you usually work one shift, and are suddenly asked to work another, it is your job to determine if there is a difference in the table setting and learn it before you begin your shift. In the fine dining restaurants, each member of the wait-staff is assigned to a specific group of tables, called a station, and each station generally has a table or a cart from which they supply linens, silver, glasses, and china. The table will also have room for bread and butter for your station, as well as a thermos of hot coffee and a pitcher of water. Your customers should never have to ask for china, silver, or linen. Each table should be set appropriately before the guests are seated. All glasses and silver must be spotless. The table settings must be perfectly arranged. Each restaurant will have a diagram for how each cover is to be set. The cover is the space, about the size of a placemat, on which the table setting for each guest will be placed. Some establishments actually use a ruler to measure the distance of the fork on the left side of the plate from the dinner knife and teaspoon on the right side of the plate. 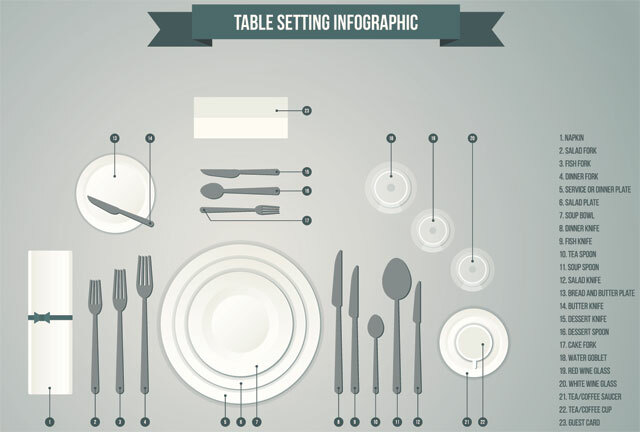 Once you have set a couple dozen place settings, you will be able to tell at a glance if your table has been set properly. Generally speaking, the fork is to the left of the plate, knife and spoon to the right of the plate with the blade of the knife facing the plate. These utensils should be approximately one inch from the edge of the table. The folded napkin is placed to the left of the fork, or fanned out on top of the charger, or large dinner plate that is not used as an eating surface. Breakfast service must be quick, prompt, and cheerful. Many patrons are not morning people and are grumpy until they've at least had their first cup of coffee, and others do not cheer up until they have had their breakfast. All breakfast foods need to be served at the appropriate temperature, so prompt service from the kitchen to the table is vital. Do not wait for your guest to finish the first course of their breakfast before bringing the hot entrée. Fresh fruit or fruit juice is usually the first course for breakfast and it is served first, with the dishes or glasses removed before the next course, which might be cereal. This course is then removed prior to bringing out the hot entrée. Coffee is placed to the right of the spoons. Finger bowls can sometimes be used for breakfast service. If fruit may have stained your customer's fingers, these are served immediately after the fruit course; otherwise it is offered at the end of the meal. The check is presented face down to the right of the cover or on a clean tray. Lunch guests are categorized into two groups: business people, who have a short period of time for lunch and need to be served quickly, and the shoppers, ladies' groups, or travelers, who have more opportunity for a leisurely lunch period. Your biggest job here is to serve those who need to eat quickly with prompt service while not rushing the second group of individuals. Beverage is always first, usually ice water. Chilled butter is placed on a cold bread and butter plate. All foods are placed in the center of the cover and then removed when finished. The only exceptions are the salad plates, which are placed to the left of the forks, about two inches from the edge of the table, and the bread/rolls, which are placed to the left of the salad plate. Hot beverages are placed to the right of the cup and saucer, with creamer above the cup. If dessert is ordered, crumb the table first. This means you use a small device to remove any crumbs left from the bread or entrée that have landed on the cloth in front of your guest. Place dessert silver to the right of the cover, place the dessert plate in the center of the cover. Serve hot beverages as requested. Remove the dessert plate when your guests are finished. Lastly, present the check face down. Most dinner patrons are looking for a dining experience and will not be in a great hurry. While they may not be in a hurry, it is necessary to avoid any long waits between courses, which will annoy your guests. Be very observant without hovering. Serving from the left, place the appetizer service on the center of the cover. If a tray will be offered for the guest to serve himself, an empty appetizer plate must be placed in front of him first. Place the soup or salad service on the center of the cover. All service from a course is to be removed prior to bringing out the next course. If the entrée is served on a platter, it is placed directly above the cover with serving silver to the right. A warm dinner plate is placed on the cover. Or, if the entrée is served Russian service style, then the plated entrée is placed on the cover. Salad is placed to the left of the forks when it is served with the entrée. Beverages are placed to the right of the teaspoons. Rolls are placed to the left of the salad plate. If salad is served as a separate course, it will follow the main course. Place a salad fork to the left of the cover and the salad in the center of the cover. When finished, remove salad service. Place silver for dessert course and place the dessert service in the center of the cover. Hot beverages are placed to the right. Lastly, while not covered in this article, a successful restaurant adheres to a strict code of sanitation and cleanliness in both preparing and handling food.